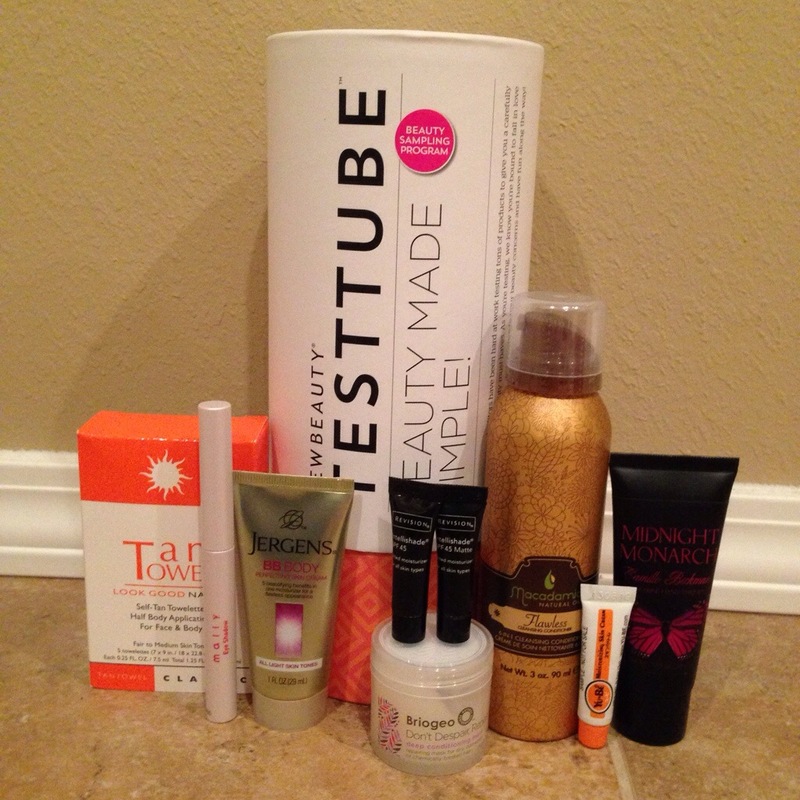 Came back from vacation and I had FIVE beauty boxes waiting for me – four of them shoved into my mailbox. How the mailman was able to achieve that feat is beyond me because getting them out of my mailbox about dislocated my shoulder. But completely worth it. Because BEAUTY BOXES. A lot of them. However, I am severely behind on reviews this month. I’ve been so busy for some reason. Can’t I just do nothing for the rest of my life please? I hate errands and housework. Only want couches, pajamas and nappy time. Please and thank you. This is always my favorite one because there’s tons of stuff in the box. And most of the time I will use every single thing. But let’s start with something I probably won’t use and go from there, shall we? It’s the TanTowel. I’m sure those of you who know me be thinking I’m insane not to want to use this product. But it’s not that I don’t want to use it, it’s that I’m so incredibly lazy that I can’t even be bothered. Yes I have white legs. Yes they scare small children. But I don’t want to consciously be thinking about pre-tanning exfoliation, applying the towel to my body in a careful and streak-free manner, taking the time to air dry before touching anything of value. And then stress for the next five hours in fear I’ve botched the whole thing and my 8th grade orange, streaky field trip legs will come back to haunt me. It’s too much anxiety. Things get better, though. I’ve always wanted to try a Mally shadow stick, and I finally got one. They sent me the Taupe shade, which I think is perfect for me. I like to start out safe before venturing out into something more daring like purple or green. I wore this to the zoo on Mother’s Day, which naturally was 125 degrees (or 80, but who can tell? ), but you’d never know it by looking at my eyelids. No creasing, no smudging. Just pretty. I may try out some more colors now that Mally is being sold inside Ulta. Remember a few months ago when Birchbox sent me a sample of the Jergens BB Body Cream and I gave it to my mom because it was the least exciting sample I could part with? Well, I got another one. I’ve decided I’m okay with this repeat (because I make up exceptions to my own rules; we’ve discussed this). I’ve been hearing a lot of raves on this product, and I felt out of the loop since I had given it away. I hate feeling out of the loop! Ninety-five percent of what I own is loop based. Serious – you write a book and it wins some kind of literary award, I instantly want to read it. I don’t care if it’s a 976-page-long doorstop about the Prussian War, if somebody said it’s amazing, I. MUST. SEE. And my brain won’t leave me alone about it. So I do what I’m told. I’m such a good girl. Got two little tubes of Revision Intellishade tinted moisturizer – one normal and one matte. I wore the matte one on the aforementioned day at the zoo. And despite the heat, the sweat, and my daughter constantly spraying me in the face with one of those mister fans, my face still looked pretty good. In short, it’s magic makeup. And it won a New Beauty award. If that’s not enough persuasion, you may want to consult someone about your mental illness. It is dire. The little jar of Briogeo Don’t Despair, Repair hair mask was cuter than it was effective. It was a decent conditioner, but I didn’t think it did anything special. My Carol’s Daughter is so much better than this in smell, strengthening, softness. Luckily, it was a 2-time-use product for me, so I am done with it. Kaput! Goodbye. Now for some shampoo. Or should I say “shampoo” … Received a can of cleansing conditioner by Macadamia called Flawless. It’s a shampoo and conditioner rolled into one that has zero sudsing effect whatsoever. It’s like washing your hair with lotion. It’s scary as hell. Raise your hand if you need suds. I do, I just do! Suds means soap, and soap means clean. However, once I settle myself down, it does actually clean your hair. I pump two huge dollops (can’t help myself; trying to create suds out of a sudsless product) and smear it all through my hair. I go through the motion of shampooing, no suds (sad face), then rinse. So I will finish this product without fear. But I will not repurchase. I feel like it doesn’t do a better job than normal shampoo, and I prefer normal shampoo. I need soap bubbles floating in my bath water. I need to see the fruits of my labors. I know very well it is psychological brain trickery, but I don’t care. I also can’t eat green ketchup. Sue me. Look at that little teeny tiny tube of Yu-Be skin cream. Why, it’s just a baby! This is one of those all-purpose skin creams that you can use pretty much anywhere on your body. I gave it to my husband so he can put it on his feet, particularly on his heels where they are very dry and cracky. He did not like it one bit. Said I’m messing with what he refers to as his “working man’s feet.” I refer to them as BLECH. However, because the tube is so tiny there’s only a two time supply, so I will have to live with his heels scratching the satin on my bedspread for nigh on eternity. Last product in the box is a Birchbox repeat. Got the Camille Beckman glycerine hand therapy in Midnight Monarch. Luckily, I love this stuff. After my Birchbox sample, I bought a full-size tube and I use it almost every night right before bed. So I brought this smaller tube to work with me, and I use it several times a day. I smell like a 15th century Turkish harem. I am delicious. Okay, that’s all. I have a billion other boxes to go love and appreciate, so I’ll see you next time. I will definitely check into the foot mud. I could probably trick him into it at the very least. You know the sounds of snaggy skin dragged across a silky blanket? Might as well be fingernails on a chalkboard.